The interior of Haveli is very ornately and beautifully decorated and looks quite comfortable but, as it was a very hot evening, I decided to sit outside. 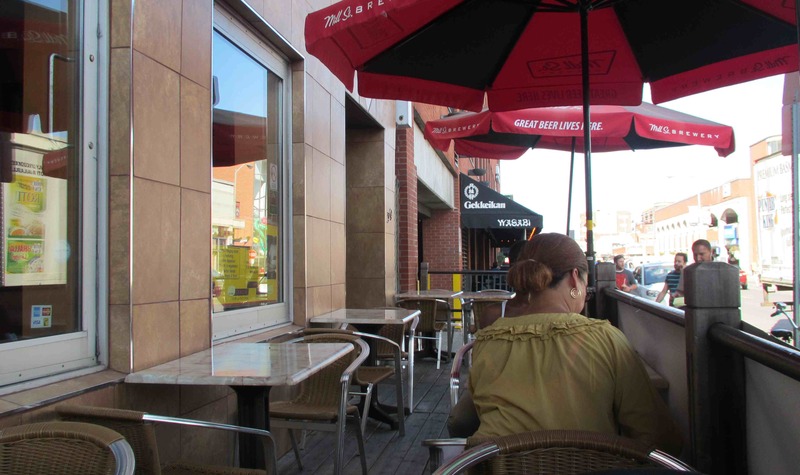 The outdoor patio is a little cramped, and doesn’t have quite a nice view as some of the other restaurant patios in Byward Market, but it is still quite pleasant. During the evening, I was served, at some point, by no less than five different people. Two seemed to be the owners of the place ( and they quite obviously enjoyed chatting and interacting with the patrons) and there was a young lady, possibly in her twenties, who may have been a daughter, involved as a server. As with the owners, this person was very friendly and helpful, and knowledgeable about the menu. The remaining two servers, one male and female, were quite young and the female seemed to be rather new as she had to seek assistance from the other young lady (the daughter?) when I posed a few rudimentary questions about the food. She was friendly though, and clearly appeared to be doing her best. 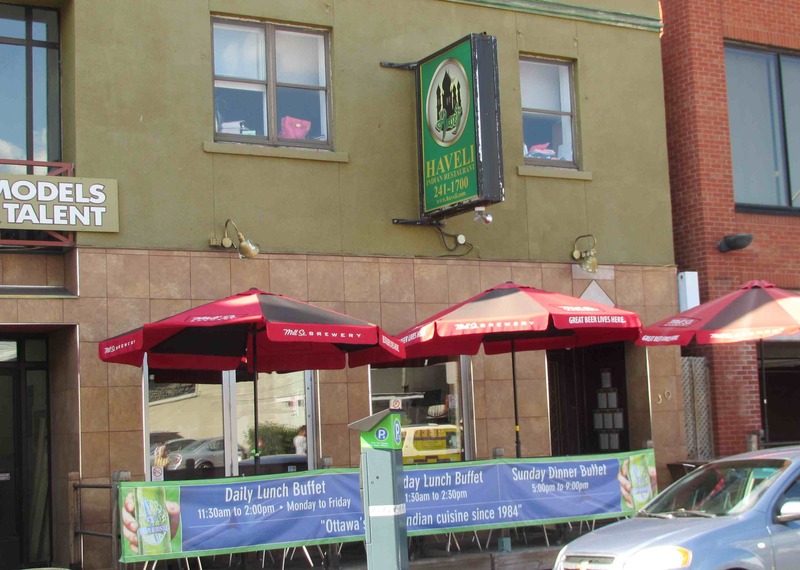 My only real criticism of the service at Haveli that evening was that the patio is a bit cut-off from the interior, and, as all the wait staff seemed to have duties inside the restaurant as well as on the patio, there were periods when it was difficult to obtain assistance. Probably, a better strategy would have been to assign one or two servers exlusivelyto the patio so as to avoid undue delays but, having said that, I will admit that didn’t have any real complaint over the service as a whole and would rate it at a good 3 out of 5. 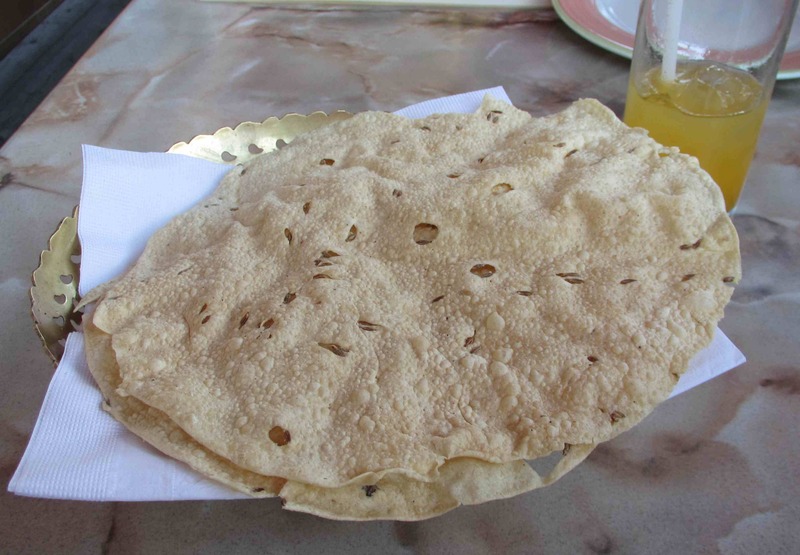 After I ordered a drink I was provided with a complimentary platter of cumin spiced poppadum, which I thought rather a nice touch, particularly since many Indian restaurants charge for this item. I enjoyed two beers that evening, ‘Cheetah’ and ‘Cobra’, both of which were described on the menu as being Indian brews. I discovered after the fact, however, that ‘Cheetah’ is in fact brewed in Toronto, although apparently with the Indian consumer in mind. For a cocktail, which I actually ordered before the beers, I chose a ‘Bombay Blast’, which may be a proprietary mix, and consisted of rum and tropical fruit juices. The taste was largely that of mango, but it was very nice and very much suited to the ambience and heat of the summer evening. This dish looked quite pretty but was ultimately rather mediocre. 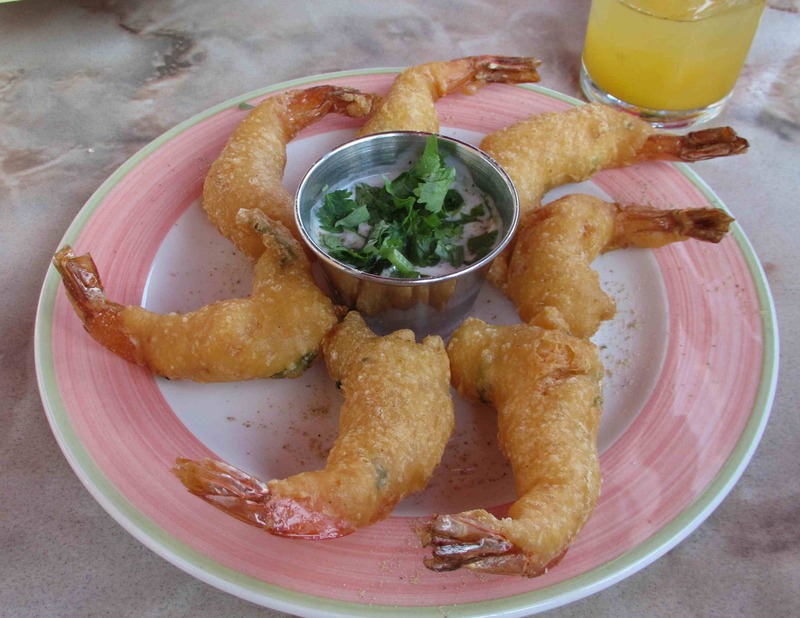 The menu described it as being shrimp lightly batterd with herbs and spices but the batter was not spicy and was only saved from being completely bland with addition of a few fragments of cilantro. The accompanying dipping sauce was yoghurt with lots of mint and, though this helped give some flavor to the pakora, the whole effect was not especially tasty or interesting. I rated it only at a 2 out of 5. Haveli offers a number of Vindaloo preparations from which the customer can choose their selection to be ‘hot’, ‘very hot, or ‘extra hot’. I chose the medium-heat variety and, although I am not sure, I may have been treated to the ‘extra hot’ sort as it turned out to be a very ‘brow-mopping – eye-watering’ sort of curry indeed. 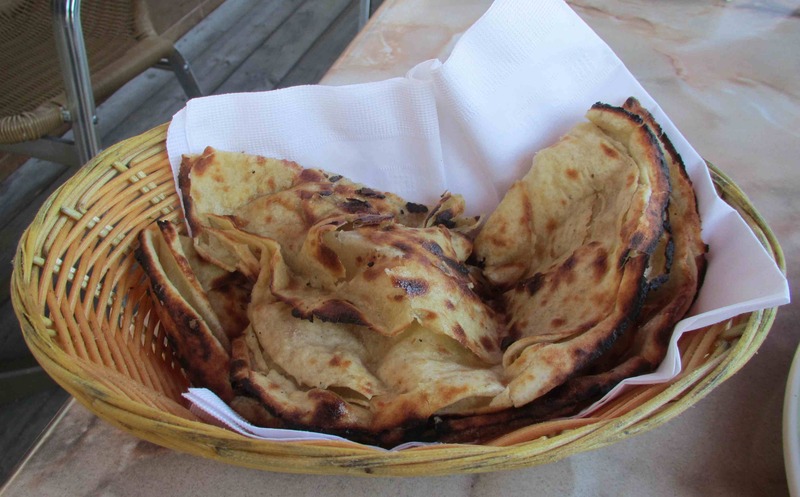 Still, I was favorably impressed with the dish as the lamb was juicily tender and not cooked to death, as is often the case in some Indian restaurants. 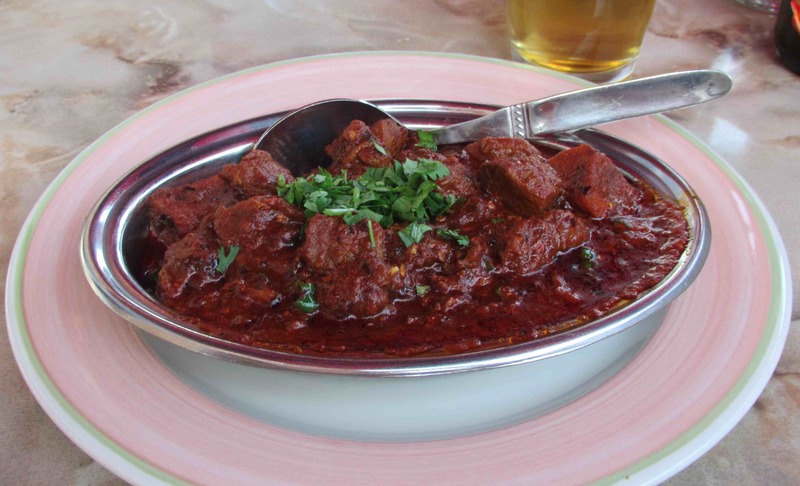 The sauce was quite oily, but, while this may not be to the taste of some westerners, it was still a good traditional Vindaloo other than being not quite as vinegar-tangy as such dishes usually are. I was not able to taste a great deal of garlic (and this really should be the case) but, in truth, the spicy heat of the dish may have numbed me a little. In all, though, while not the absolute best Vindaloo I have ever eaten, this dish was very good and I rated it at a respectable 4 out of 5. Great review….. Thank you. Still trying to figure out how to add the Food Bloogers of Canada badge and Urban Spoon tie in!! For FBC, drag an Image widget into your sidebar column. Download an FBC image file from FBC, load it into your image library and then put the link into the ‘Image: URL’ space on the widget form. For me, this is: https://sybaritica.files.wordpress.com/2012/05/white_member.png. For Urbanspoon you need a text widget. You then edit the text with html code you can get at Urbanspoon. I forget exactly where you get the html code… somewhere at Urbanspoon there is a link for you to ‘add a badge’ to your site … something like that, anyway. After all of your great reviews, I am definitely planning on visiting Ottawa at some point. Isn’t there a castle there as well? 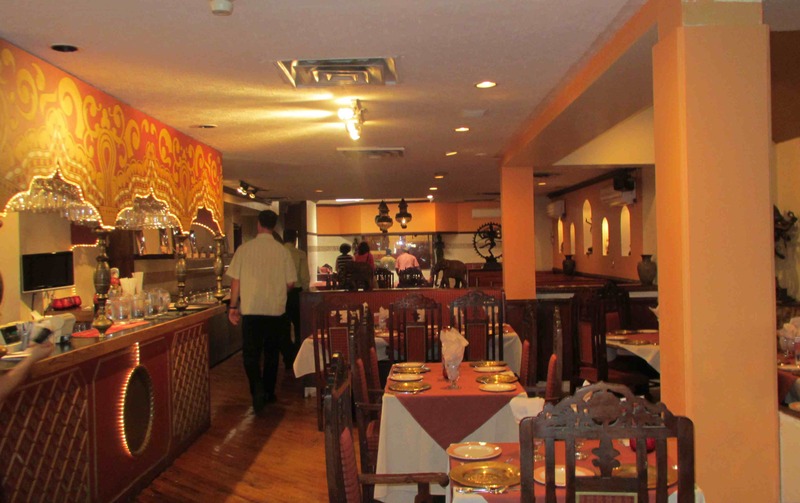 From “the Wife”: I must say that Haveli is my absolute favourite Indian restaurant in Ottawa. I usually sit inside and the the service is spot on. As John mentioned, it seems to be a family run establishment and the owners love to chat with the customers. I usually have one of the Thali platters and have never been disappointed. I like Shafali, too, but the interior just doesn’t have the decorative touches and warmth of Haveli nor the personal touch of the owners. Nieither will disappoint, however.